Looks: miles from the most important thing for a strategy game but guaranteed to make me coo and immerse myself in the high-commander fantasy. Creative Assembly has just revealed Total War: Warhammer's campaign map, and by Sigmar it has been a good year for Warhammer fans. It's early days, of course, but from the 15-minute flyby it looks like CA has nailed the aesthetics of the Old World, from the Badlands up to the Chaos Wastes, handling the source material with the same care as they did Alien. It's bloody massive. More impressive than the forests and volcanoes of the map itself are the incidental details that accompany a takeover by one of the four playable races: Greenskins, Dwarfs, Vampire Counts and the staple Empire humans. As Greenskin warlord Muzg the Astute occupies a Dwarf fortress, the stonework gets buried under a heap of crude lumber, bonfires and red skulls. As the Vampire Counts move into a province, the greenery withers and dies. There is no doubt about which marauding, bloodthirsty army controls a region. 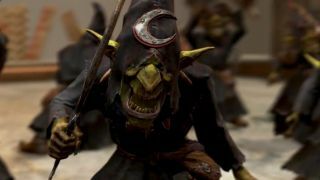 The video offers some insight into the Greenskin campaign—most promisingly, how different the Greenskin campaign will be from everyone else's. The penchant for Greenskins to tear themselves apart just for something to fight is wired into the 'Fightiness' meter, which makes it very much in your interest to keep on pillaging. Max it out and you'll start a WAAAGH! (sort of like a Highland charge, but greener and angrier). If you're the kind of awful person that stresses me out with hyper-agressive play, these are your guys. For Total War fans, there's a lot of detail worth absorbing in the video, including the upgrade systems for buildings and heroes, and for Warhammer fans it's worth it just to soak up the atmosphere. Better still, we got the chance to interview campaign designer Rich Aldridge on some of the finer points of races and diplomacy. Both Wes and Tim went misty-eyed over the E3 demo way back in June, and so far that first impression is holding up.